CHAUCER, Geoffrey. Workes of our Antient and lerned English Poet, Geffrey Chaucer, newly Printed. Edited by Thomas Speght. London: Impensis Geor[ge] Bishop , 1598. First edition edited by the Chaucerian scholar, Thomas Speght (sixth published edition). Folio (11 7/8 x 8 inches; 302 x 204 mm.). , 394,  leaves. With errata leaf bound at the end. Lacking the initial and final blank leaves. Black letter. Double columns. Engraved portrait of Chaucer on ¶7v after Hoccleve. Woodcut arms of Chaucer on A6v, and woodcut illustration for the “Knight’s Tale” at head of B1r. Woodcut title border (McKerrow and Ferguson 148) and three divisional titles within repeated woodcut border (McKerrow and Ferguson 75). Woodcut historiated and floral initials. Eighteenth-century paneled calf, rebacked with (possible original) spine laid down. A bit of rubbing to boards and spine. Some worming sporadically throughout, mainly marginal. Some toning and browning throughout. Previous owner's old ink signature on title-page, and old ink notes on dedication page, top margin. Overall a very good copy. Housed in a custom quarter morocco clamshell. This is the first edition of Chaucer edited by Thomas Speght (fl. 1600). He introduced, for the first time, a biography of Chaucer in English, a glossary of Chaucerian words, and the spurious “Dreame” and the “Flower and the Leaf” (both of which Francis Beaumont apologized for in the preface). 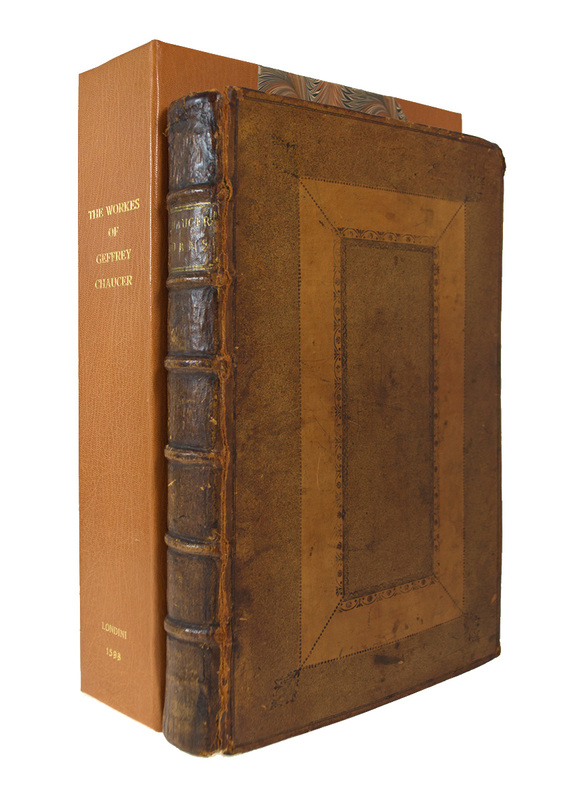 “This is the first edition edited by Speght who had the assistance of John Stowe, Francis Thynne, Francis Beaumont, the elder, and Robert Glover. The most remarkable feature of this edition is the glossary which was largely the editor’s production and was the main object of Francis Thynne’s Animadversions” (Pforhzheimer). 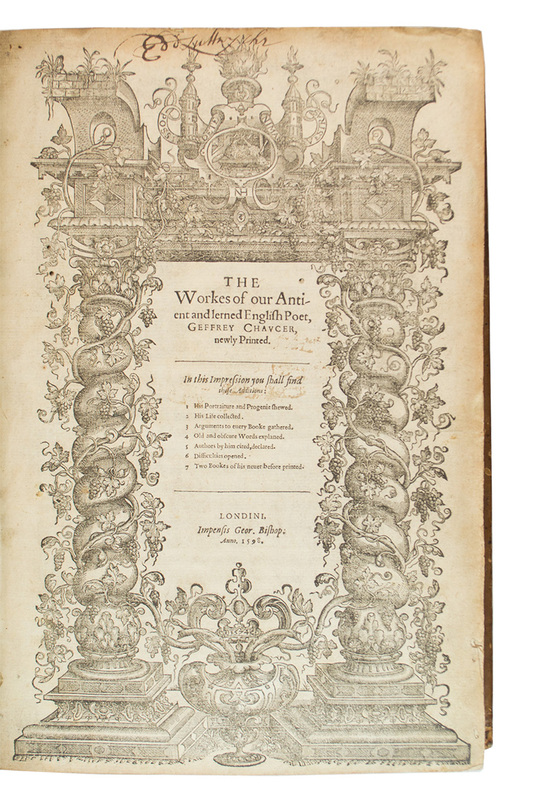 Speght was also the editor for the seventh edition printed in 1602. Grolier, Langland to Wither, 43. Pforzheimer 177. STC 5077.